Quick, which movie released in the summer of 1998 about an asteroid on a collision course with Earth featured crews landing on the space rock to blow it up? Which CG-animated movie released in fall 1998 about a colony of ants has a scene set in a paradise for insects, where the protagonists interact with various other bugs? Which 2010 family film about a villain turned good guy features our anti-hero getting a helping hand from his minion? When you think back on the movies you've watched, do you ever get them mixed up with other, all-too-similar films? You do if you named just one movie in response to any of the above questions, because believe it or not, those plot points happen in not just one, but two movies released just months (sometimes weeks) apart. In order, the correct answers are Deep Impact and Armageddon, Antz and A Bug's Life, and Despicable Me and Megamind. It should be no surprise that there exists competition among studios for similar projects. As soon as Marvel Studios showed how to make all the money in the world with shared universes, other productions followed suit. There is, of course, the DC Extended Universe, a direct competitor to Marvel's superheroes, but there is also the MonsterVerse, which will bring together Godzilla, King Kong, and various other kaiju, the now-defunct Dark Universe which aimed to tie together Universal's iconic monster franchises, and more. Even The Nun, which would've just been called a prequel pre-2008, is part of "The Conjuring universe" now. In other words, sometimes a twin film is just a result of two production companies pursuing trends. For a prime example of this, look no further than the biggest trend in entertainment right now: superheroes. Batman v Superman: Dawn of Justice and Captain America: Civil War both deal with heroes battling each other as much as a villain, while simultaneously asking if superpowered beings need government oversight. They were also released a mere two months apart, and all of the above would arguably qualify them as twin films. However, far from more nefarious explanations, the similarities in plot are broad strokes at best, and the proximity of these two movies' premieres is likely a combination of coincidence - BvS was delayed by nearly a year - and Warner Bros' desire to get ahead of the box office juggernaut that is the MCU. To be fair, that last bit is speculation on my part - Warner Bros. maintains it was "not flinching" by bumping BvS' release date up from what would have been direct competition against Civil War. Other rivalries are a bit more... overt. You may have noticed over the years that Dreamworks and Disney films sometimes shared a theme or visual aesthetic, if not extremely similar stories. For example, the following movies all released within months of each other: Madagascar and The Wild, Flushed Away and Ratatouille, Shark Tale and Finding Nemo. There are other twin films from these two studios with more superficial similarities, such as The Road to El Dorado and The Emperor's New Groove, as well as Shrek and Monsters, Inc. 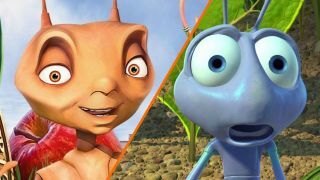 However, perhaps the most egregious twin films between these two companies are Antz and A Bug's Life. In 1994, A Bug's Life (then simply known as "Bugs") was pitched to Disney higher-ups - coincidentally, this happened on the exact same day that Disney chairman Jeffrey Katzenberg departed the company. Katzenberg would go on to co-found Dreamworks, which produced Antz. The stories diverge from there, with Katzenberg claiming the idea for the story came from one of his executives, while Pixar director John Lasseter has expressed doubt about the truthfulness of this. The movie-making process is far more long and involved than many may think, and projects rarely survive their trip to the big screen looking like they did at inception. This was the case with Deep Impact, which began as a remake / homage to the 1951 film When Worlds Collide, morphed into a Steven Spielberg project based on the novel The Hammer of God, and finally merged with a script by Bruce Joel Rubin (which was itself later re-written). It's Rubin who sheds some light on why Deep Impact is part of the twin film phenomenon. In the book Tales From the Script: 50 Hollywood Screenwriters Share Their Stories, Rubin recalls a meeting he had with a colleague who worked at Disney, during which he spoke about his work on Deep Impact. Almost immediately thereafter, Disney (through its Touchstone Pictures and Buena Vista Pictures divisions) began work on Armageddon. Rubin stops shy of accusing anyone of outright plagiarism, but the implication is clear. Other splits in the movie-making process are more amicable. Early in its development, Mark Wahlberg and Will Ferrell were tapped for a buddy cop film called Cop Out. "But wait," you might be thinking, "I thought the buddy cop movie with Wahlberg and Ferrell was The Other Guys?" You are correct! Though Wahlberg and Ferrell eventually decided against following through on Cop Out, they worked with other creatives to do a slightly different take on the concept, which led to The Other Guys. Cop Out proceeded onward, replacing Wahlberg and Ferrell with Bruce Willis and Tracy Morgan. Both movies came out in 2010. Other times, twin films really are just a coincidence. A newsworthy event might inspire multiple writers, who pitch similar scripts to different studios. If they move forward at the same pace, you end up with situations like United 93 vs Flight 93, two movies about the passengers who fought back against terrorists on 9/11, or U - July 22 and 22 July, movies about the 2011 massacre in Utoya, Norway. Regardless of their origins, twin films are an interesting phenomenon, one that gives us just a peek at what goes on behind the doors of a Hollywood board room or cluing us in on the whispers floating among the makers and shakers of the industry. So next time you see a movie and think, "Isn't this just like <insert other movie>?" do some digging: you might be surprised to find more drama lurking behind the scenes than what's in them.